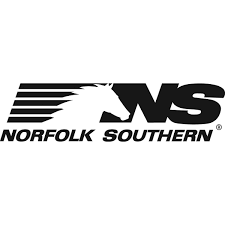 Norfolk Southern (NS) has reported full year results for 2018. Comparing reported 2018 figures to adjusted 2017 (non-GAAP) figures, year-end revenues totalled $11,458m, up 9% year-over-year. This was attributed to higher volumes, rates and fuel-surchage income. Operating income grew 17% to $3,959m. Net income was $2,666m, up 39% from $1,922m the previous year. However, non-adjusted 2017 GAAP figures for net income in 2017 are $5,404m, the difference seen in the adjustment comes from tax benefits and reforms which added $3,482m to net income. General merchandise accounted for 58.9% of total railway operating revenues with Intermodal and Coal corresponding to 23.2% and 16.5% respectively. By reported merchandise sector, NS experienced unit volume growth in Chemicals (7%) Agriculture/consumer (4%) and Paper/clay (1%). However, there were declines in Metals and Construction (-2%) and Automotive (-5%).